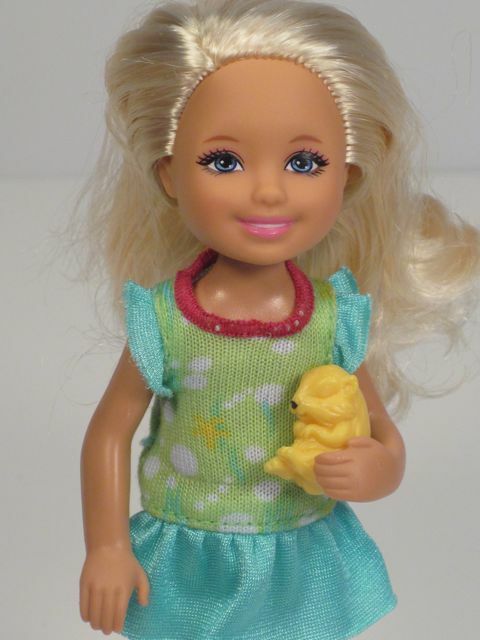 I actually ended up with Renee and her chihuahua, too, because apparently I have a soft spot for small dogs. It's greedy to keep all of these dolls, though, because I really just want to see the hamster and the chameleon. One of you can have Renee and her chihuahua if you want. See below. 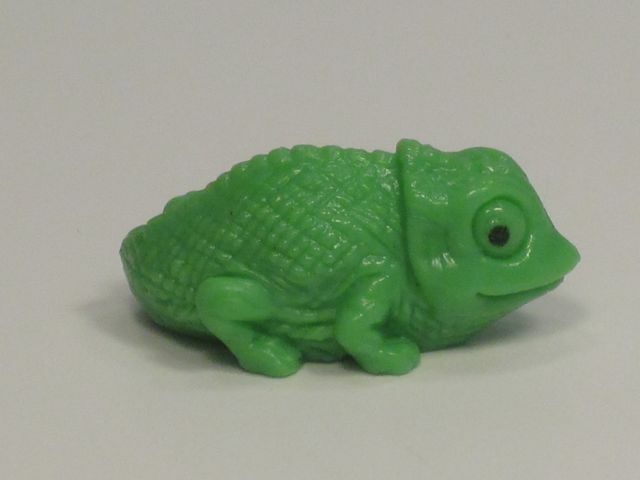 The chameleon is tipped on his side, so I still can't see him! 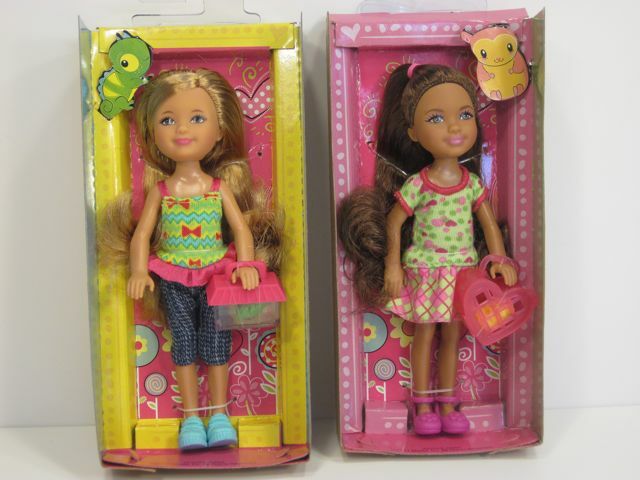 These dolls are very easy to get out of their boxes. Right away, I like Tamika's dress better and Viveca's shoes better. Very cute right out of the box! Tamika has a happy, serene face. I love her expression. Her lips don't photograph well. They are definitely a matte purple/pink color, but they're not quite as two-dimentional as they look in this picture. She has lovely long hair, but it is a bit uneven and ratty in the back. I like the lopsided ponytail style on her. She just needs a little haircut, I think. Her dress has a stretch knit bodice with a heart and circle pattern. The skirt is a different, crisper fabric and has a coordinating plaid. I was hoping they'd all have outfits that matched their pets (like Chelsea's bubble dress), but I don't think there's a connection between this dress and a hamster. What would a hamster-themed pattern be, anyway? An exercise wheel geometric print? Fake fur? Hmm. I don't think you're supposed to mix hearts and plaid. Time to see the hamster! He comes in a tiny heart-shaped cage. I guess the shape of the cage matches the hearts on her dress. That cage is way too small for a hamster, by the way. I worry a bit about his quality of life in there. Maybe she is just transporting him somewhere fun? We'll go with that. OMG. That doesn't look good. Is it dead? 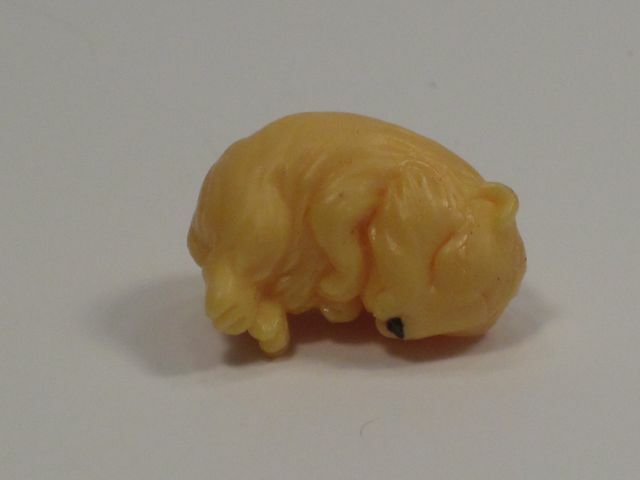 After a childhood filled with many small pets, the horror of finding a dead one is still among my worst nightmares. He's smiling. Whew. He must be alive and well. And of course hamsters are nocturnal, so he should probably be sleeping now anyway. He'll cause trouble later when Tamika is trying to get some rest. He's absolutely adorable. No offense to Captain Bubbles, but this hamster is much cuter than a fish. I think I'll name him Pan, which is "nap" backwards, and also the Greek god of nature. Maybe I'll call him Panini instead. 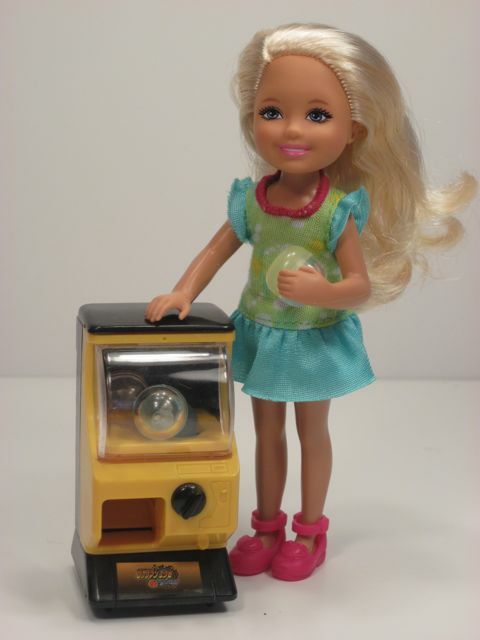 This doll has real trouble standing up on her own. 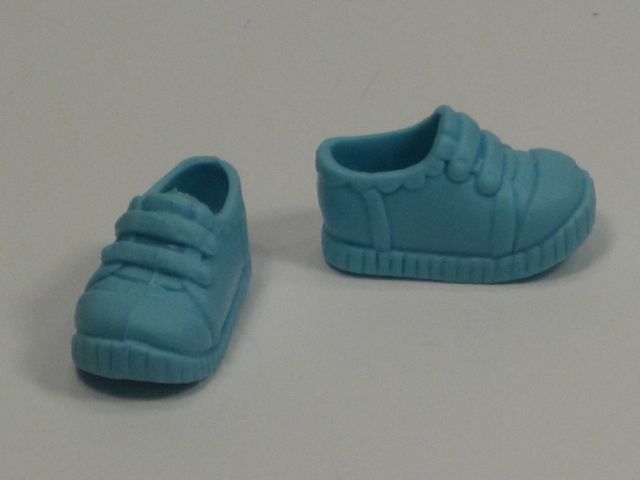 Not sure if it is the shoes, or just the balance of this specific doll. She has a calm, happy face that is very similar to Tamika's. I don't think they're identical, but the makeup differences make it tricky to tell for sure. 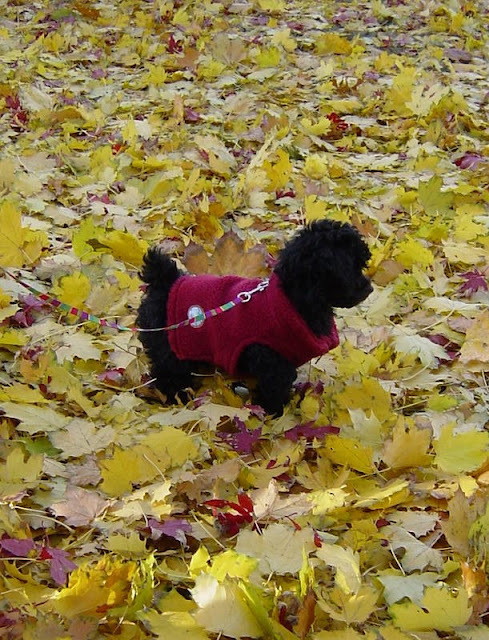 She has beautiful coloring with dark brown eyes and a lovely shade of golden blonde--almost strawberry blond hair. I like how her hair is swept to the side and tied back. Very simple but charming. The zig-zags are reminiscent of a lizard, I guess, but I don't much like the overall effect. 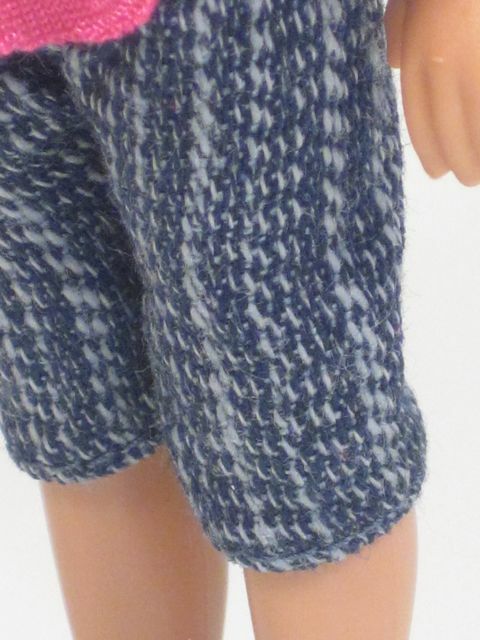 The pants are colored like jeans, but made from a very coarsely woven fabric. They're the texture of wool or burlap. 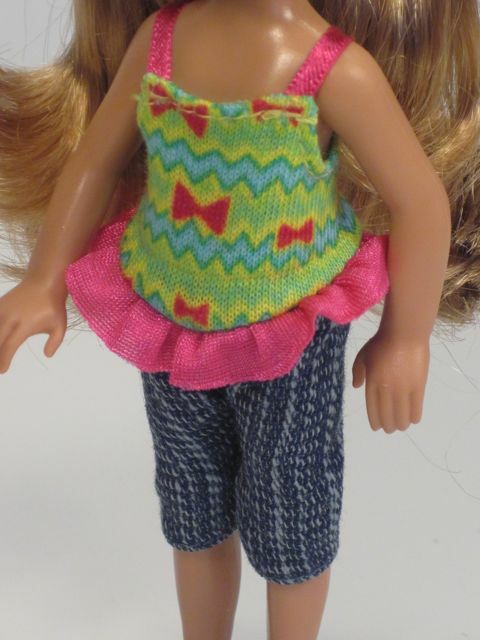 The whole outfit is like a swimsuit top attached to wool capri pants. Bizarro. I like that these shoes are different from the sandals of the other girls. Maybe Viveca is a bit of a tomboy. It turns out that the shoes are not what's preventing Viveca from standing well. She doesn't stand any better in bare feet, nor in Tamika's shoes. Time to meet the chameleon! Oh, he looks very, very cute! 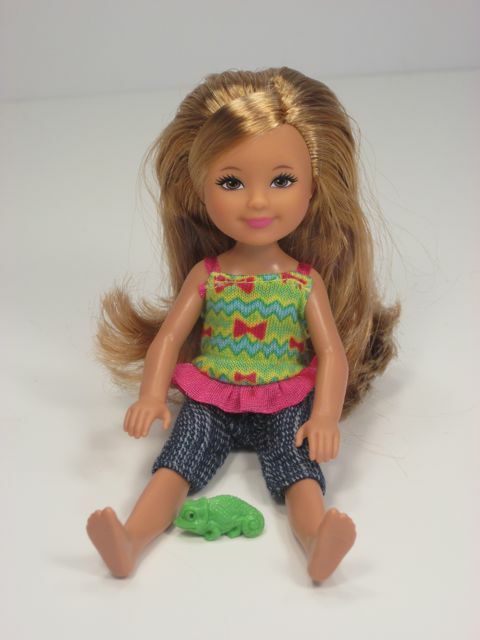 You know how I love Tonner's Cami dolls, so this chameleon's name will be Chami. If you like chameleons, check out this beautiful picture of a real chameleon from National Geographic. I love their feet. Very cool. 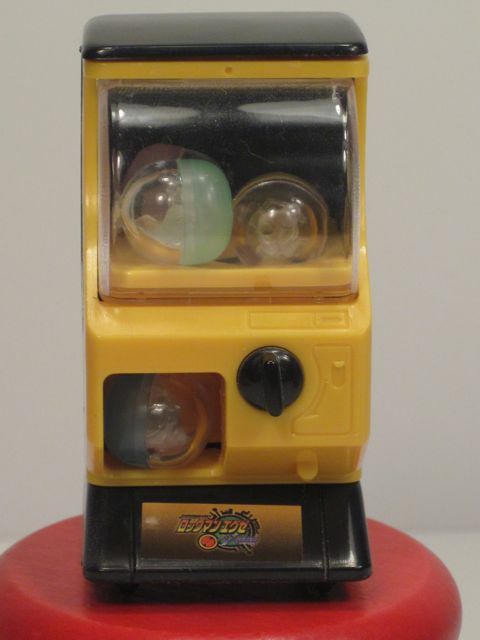 This is a vending machine toy that is a mini vending machine. 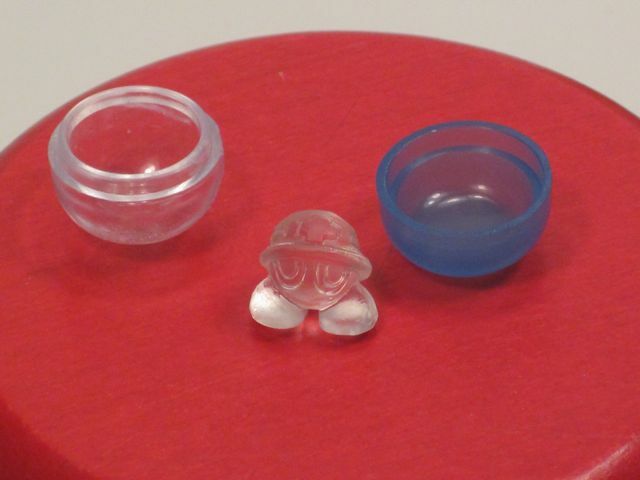 In other words, somewhere in Japan, there's a real full-sized vending machine with these little toys inside. Fantastic. 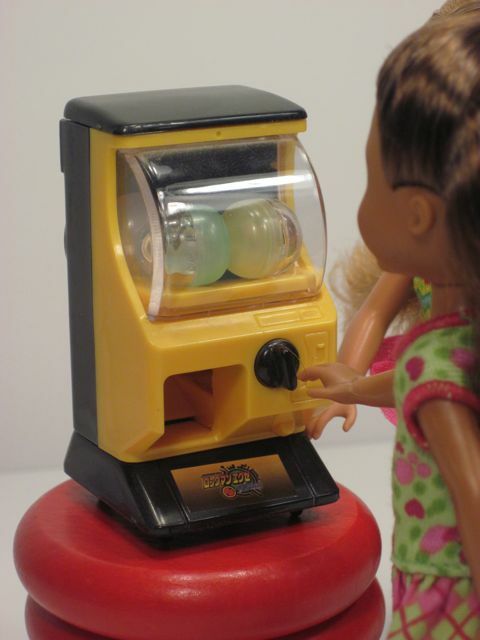 You actually spin that little dial and a tiny capsule comes out! Oooh! I got the blue one! Well, ok, even after I open the capsule I'm not exactly sure what the toy is, but the point is that the capsules actually open and have miniscule toys inside. I love it. Before I give my final opinion, I have one more mission with Chelsea and her friends. 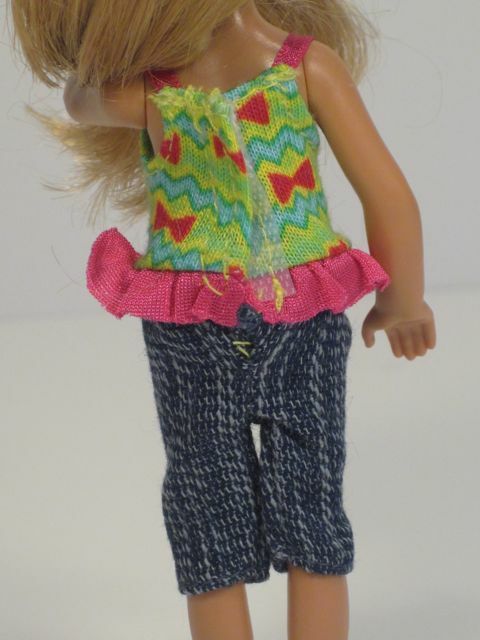 I told Kristi at Lemon Dolls that I would test to see if Chelsea and her crew could share clothes with the mini Pullip dolls. Short answer: they can't. 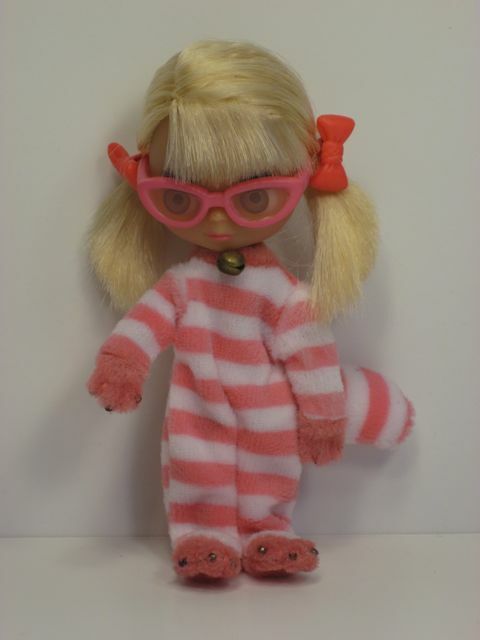 She has a large head and a tiny body with very small hands and feet--similar to a mini Blythe body. Poor Viveca can't even pull the outfit all of the way up! 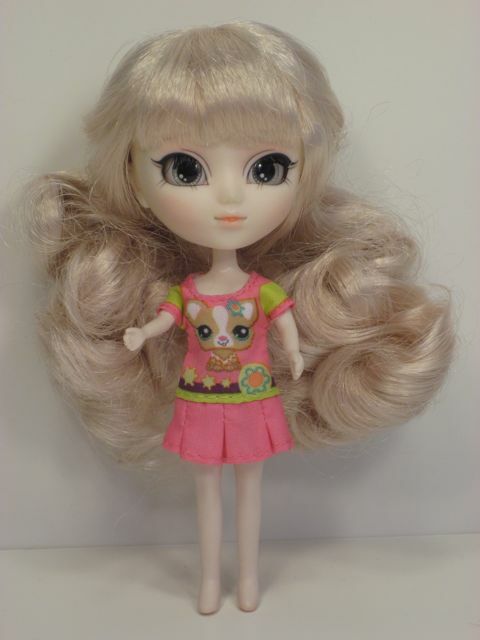 I decided to try the Littlest Pet Shop Blythe's clothes on Pullip while I was at it. 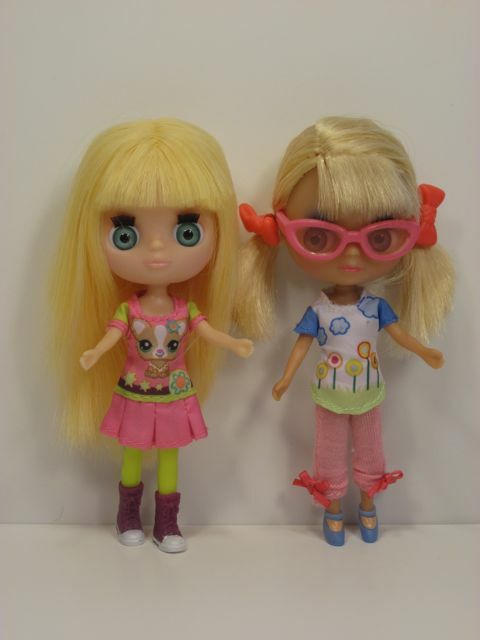 Two of my LPS Blythes. If you don't mind the cropped style. Unfortunately, this is the only piece of this outfit I have left in the house. 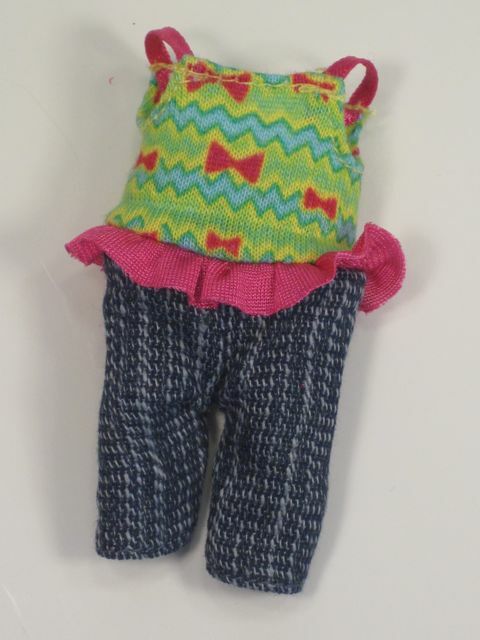 These clothes also fit Fairyland Puki Puki dolls, and so when I sold my Puki, I gave away the outfits. 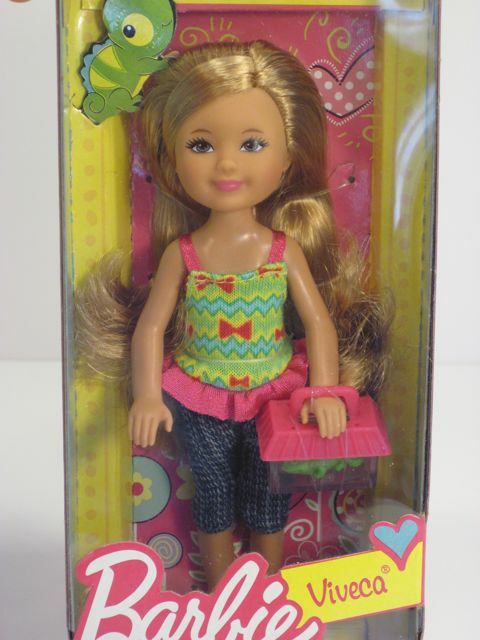 There are a few Li'l Kids outfits on the Only Hearts Club website, but I haven't seen them at Target for ages. 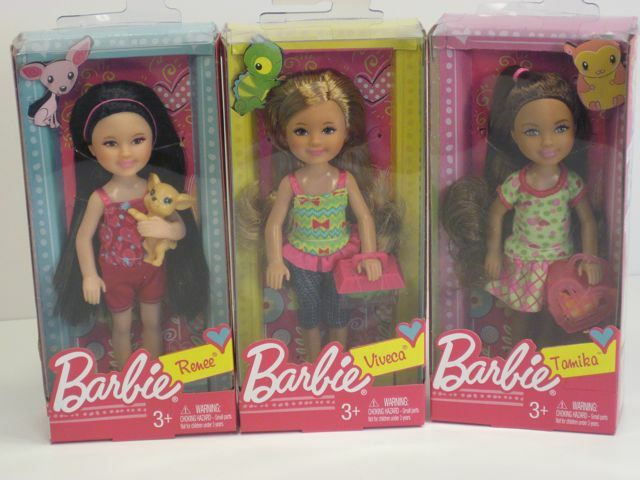 Here's a lineup of all of the little dolls I have been talking about, just so you can see how they compare. 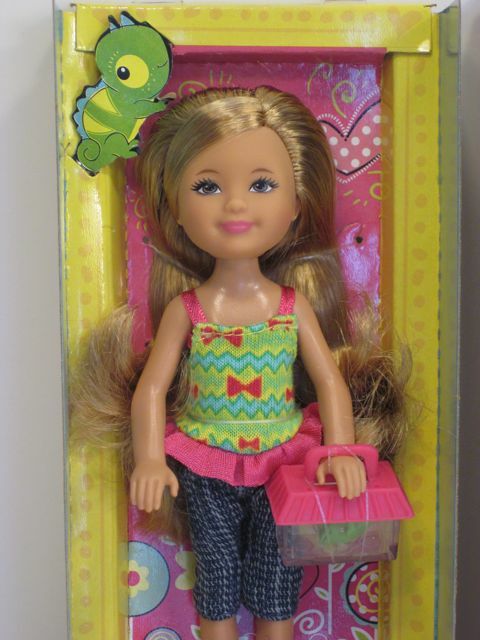 It sure looks like Pullip should be able to share clothes with Chelsea, but the problem is that the puffy outfit is hiding a truly tiny body. I have already done a review of Chelsea, so for this post, I'm going to give special awards for different categories. Like a little contest. Please add your opinions about these categories in the Comments section! 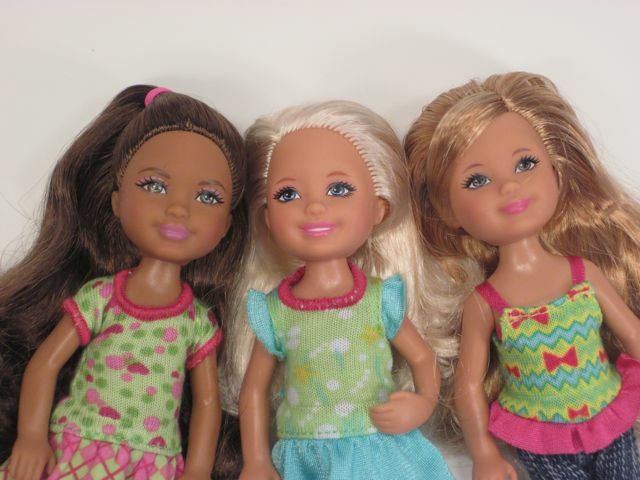 The only qualifying dolls at the moment are Chelsea, Tamika and Viveca. Most Adorable Pet: Pan (Tamika). He's alive! Best Overall Pet: Captain Bubbles (Chelsea). Still can't get over the beautiful simplicity of a pet fish. Best Overall Doll: Ah! Hard decision! I think (drum roll...) Tamika. Everything about her is very good, even though she doesn't win the most categories. If Viveca had come in a different outfit, she would have won. Chelsea always looks like she's scratching her belly. Give that girl a fish to hold! I'm glad to see an asian child doll. There aren't a lot of them. 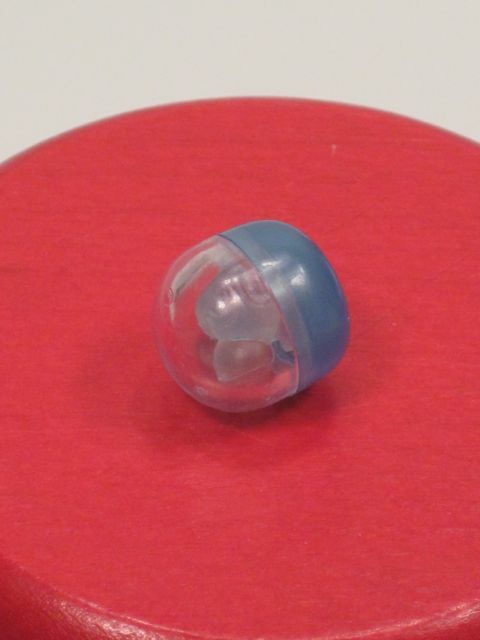 The pets are adorable--but the hamster needs one of the little mini storage boxes they sell at Office Max, with little holes drilled in it (that's what my nephews' hamsters lived in one). 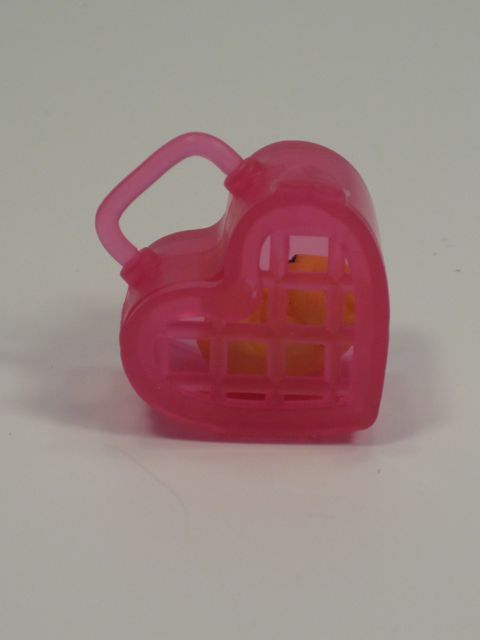 I don't know what those Office Max storage bins look like, but anything would be better than Tamika's tiny heart carrier!! Thanks for sharing these details. This Chelsea series is adorable. Love the pets the girls have. Nice direction ... giving the kiddies something to take care of instead of having them shop and consume. I enjoy the way you break down the dolls and their accessories. I bought Renee - could not resist her. I wondered though if Viveca and Renee shared the same face sculpt?. 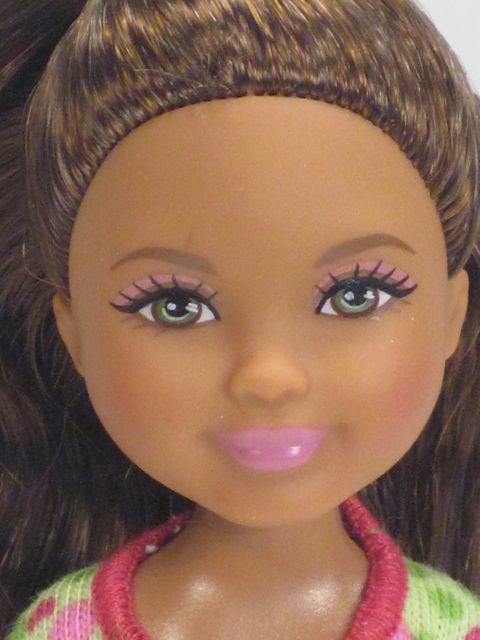 I want a Tamika, too, but I think I am waiting for the AA Pancake Barbie and Chelsea who strongly resembles Tamika with a darker complexion. Oh, snap! 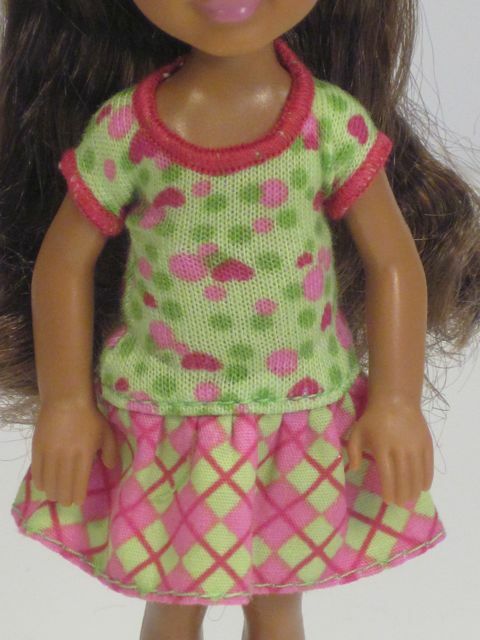 Now we'll have AA Chelsea-Tamika dolls to match AA Barbie-Nikki dolls. Hi Dana--good call to wait for the Pancake set. 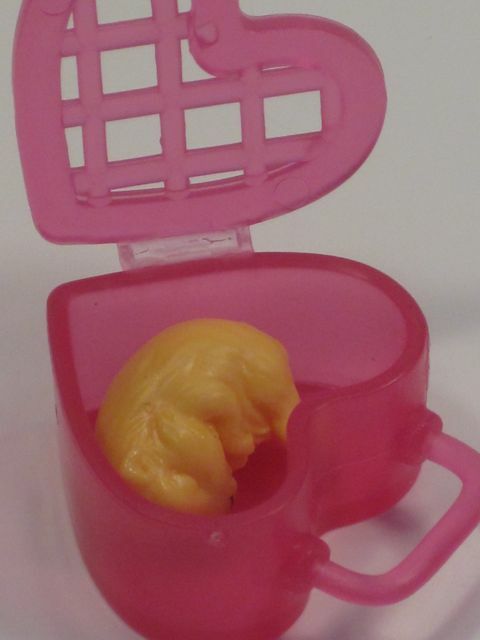 I saw that pair on the Toys R Us website. 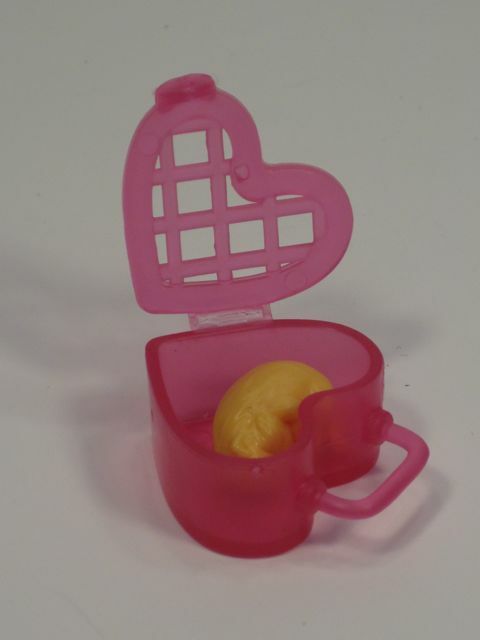 They're great and I like the little waffle maker. I think you're right about Viveca and Renee sharing a face sculpt. I just peered at them up close and the shape of their faces looks exactly the same. Funny how different the face paint makes them seem! That's my favorite expression. 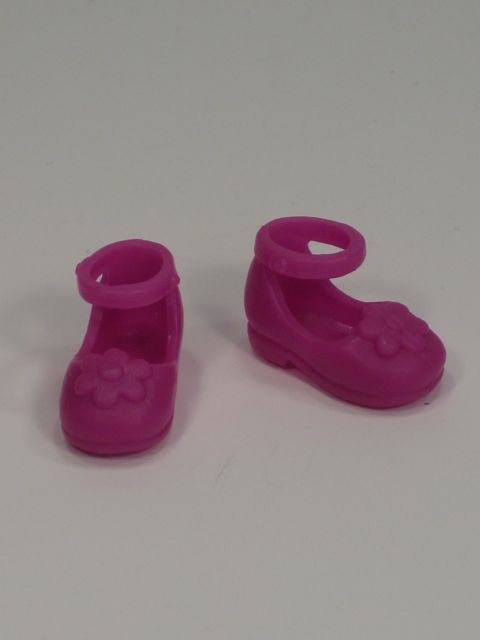 I'd like a vending machine that dispenses doll shoes in capsules. Installed in my home. 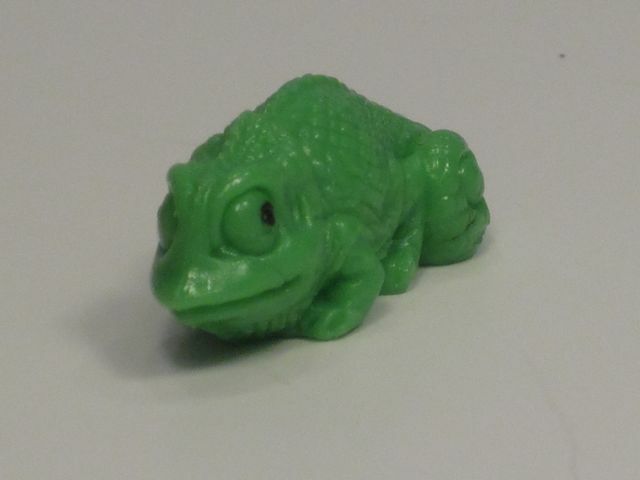 That little charming chameleon is so cute, you should be praised for not naming him Karma (nothing against Culture Club, it's just a little obvious). 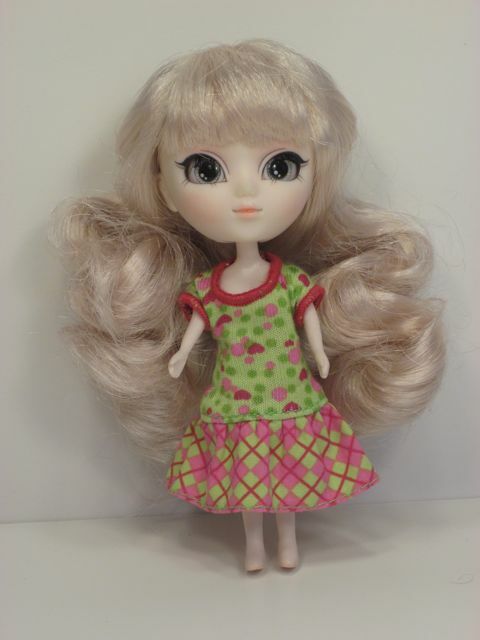 Thank you so much for trying Chelsea's dress on Little Pullip, too bad it doesn't fit. Good information to know! Karma didn't occur to me, but you and I must be about the same vintage if you've got Culture Club on your mind. ;) You know, I talked to a student the other day who didn't know who Billy Joel is. Billy Joel!! Ack! 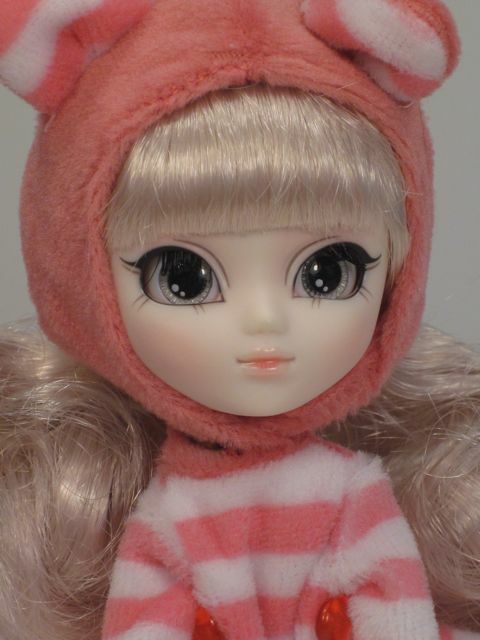 I need to try more of the LPS Blythe clothes on Pullip. Some potential there. 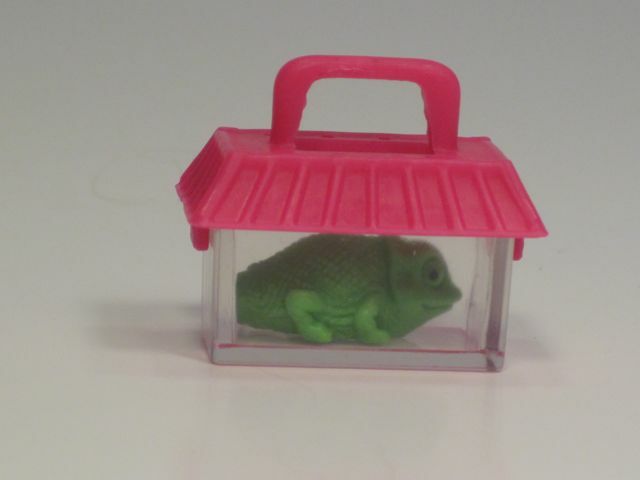 The hamster is definitely cute, but I think the chameleon is the best. He has more personality and is actually scaled to the dolls (scaled to life size, the hamster would be about as big as your poodle). I also love how the chameleon is looking at a dark spot in the photo. Coincidence? 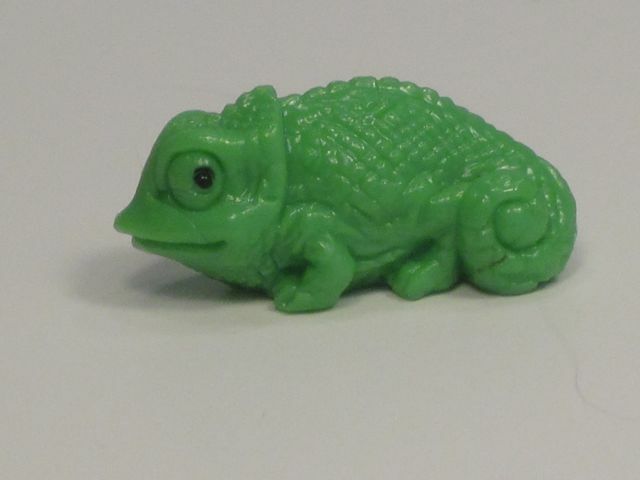 I have a soft spot for the chameleon, too, and it has nothing to do with Tangled. Well, maybe a little to do with that. Anyway--it didn't occur to me that the proportions are so off--good call! You're totally right. Pan is more the size of a guinea pig than a hamster. 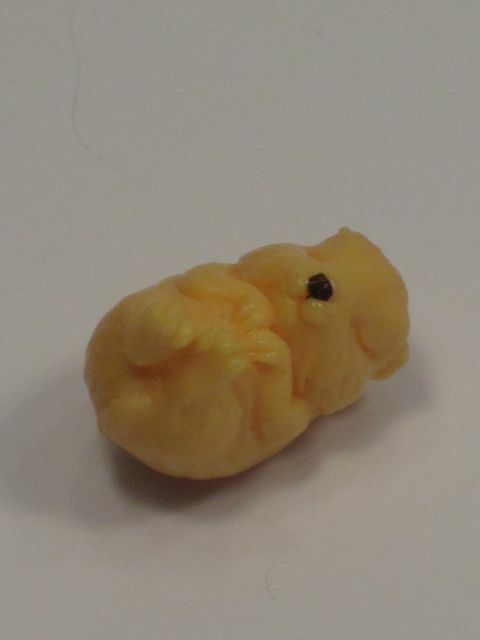 Maybe a chinchilla? 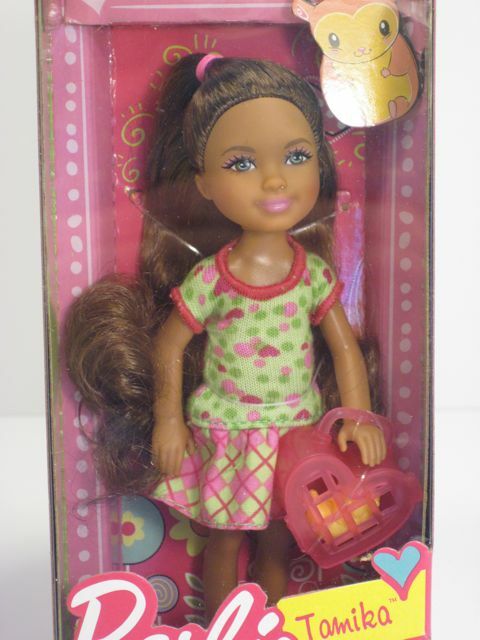 Not sure if you are still on the lookout for Hearts Club dolls (Target does NOT carry them any longer.) but I have found them at both Joann's Fabric stores and recently at Tuesday Morning stores (but I know those stores tend to vary). I am VERY guilty of buying them there or at thrift shops JUST to harvest them for clothing. I actually like their cute faces, but I just can't handle the soft bodies (the tiny girls remind me of children in snow suits and the big girls have a weird pipe cleaner look to them) I've never been able to remove their heads to even see if I could rebody them. Thank you, Korianne! I actually saw a few at Tuesday Morning here in Maine a few weeks ago--a few sets with big and little sisters together. Very cute, but I was trying to control myself. I haven't checked Joann's, but that's a great suggestion. I am so glad that they haven't just completely disappeared. 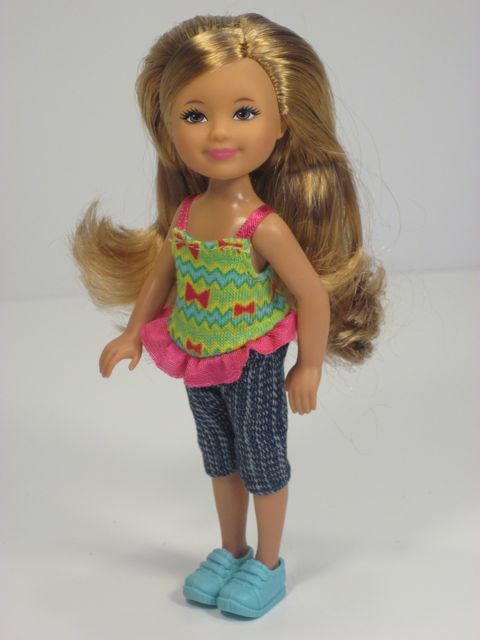 I also love them for their clothing because it's well made and it fits several of my hard-to-shop-for dolls. I have the Renee and Tamika dolls, but I don't play with them often (I'm the kind of person who buys dolls then leaves them to die on the shelf all dusty). 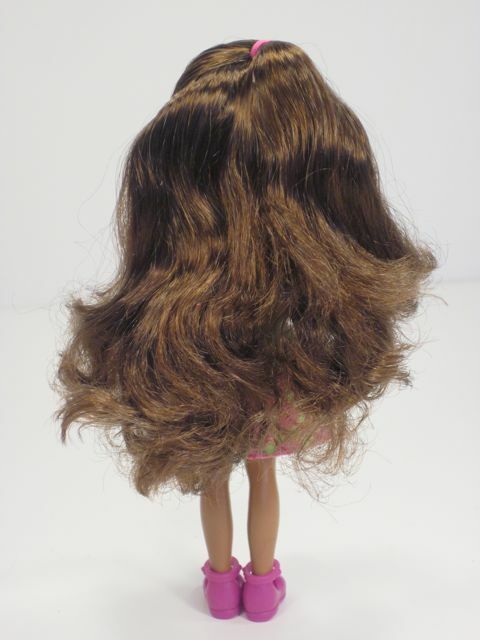 Renee's hair is VERY smooth, but it can also get frizzy from play and I had to snip the ends a bit. Her dog doesn't stay very well, it's just an all over the place shape that's awkward for her hand. 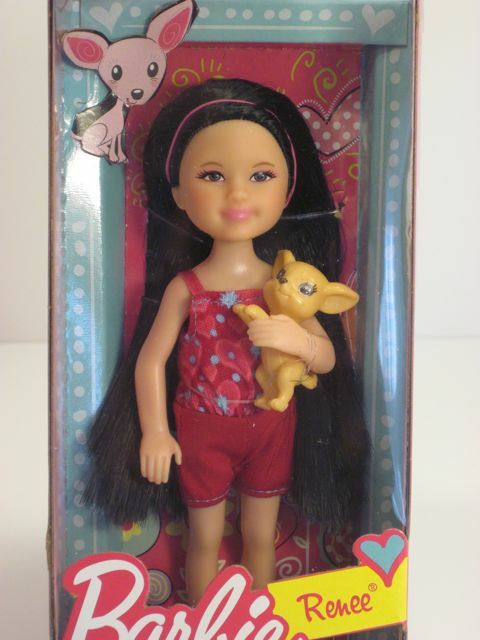 I just bought her because I have a fascination for Asian dolls. Can I have the doll with the chuwawa you said somebody could have. 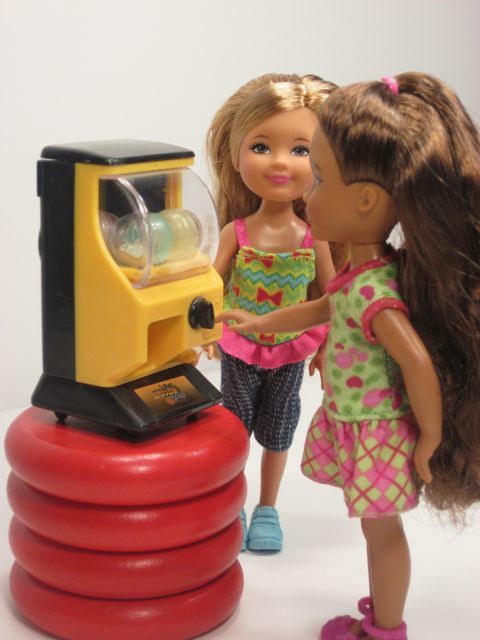 Hey, I keep looking almost over and over again at this review and am thinking constantly: I NEED THAT TINY VENDING MACHINE!! xD I wonder where you got it, though. 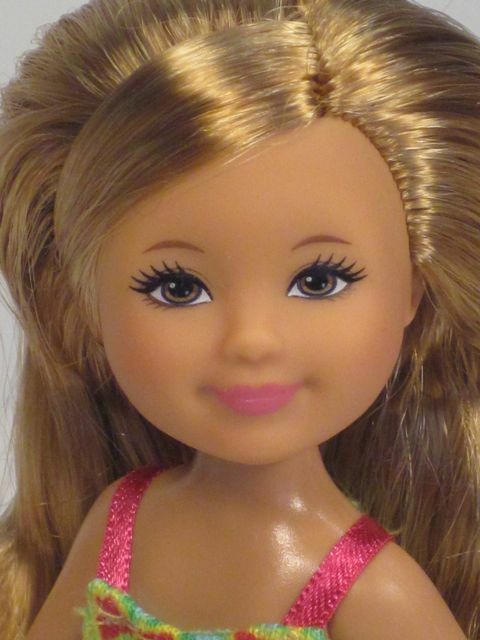 Also, I did see at my Kmart that there was a set of Barbie kid dolls that came with sports equipment, Like I saw Renee, with a Hula Hoop and Chelsea with a Tennis racket and I carried them to the checkout, but then put them down since I saw another doll (Winx Musa Sirenix and I got her :D).